In a very humble and at the same time, glorious way, Emmitt Smith, the now legendary and future Hall of Famer running back for the Cowboys, retires as a Cowboy! 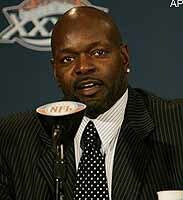 Very touching moment to hear Emmitt’s words of affection towards what it meant for him to be a Cowboy. He rushed for a total of 18,355 yards and 164 rushing TD’s, I don’t think anybody will ever match up with him. He played for 15 years in the NFL, 13 of them with Dallas. Emmitt, one of my favorites, gave me so many pleasures when he played for Dallas, and helped the Cowboys win 3 Superbowls in 4 years. So long, Emmitt, we’ll miss you!